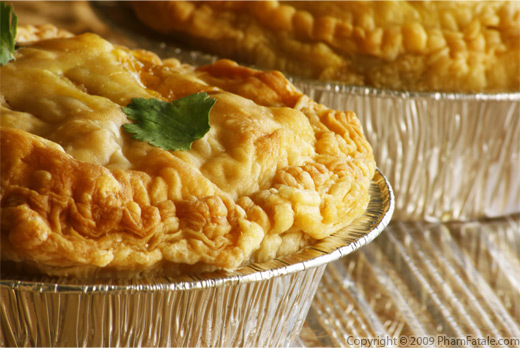 A pot pie is a medley of vegetables and meat in a thick sauce, wrapped in a pie crust. I love chicken pot pie. Unfortunately, I can never share this meal with my hubby Lulu since he's a vegetarian. I always try to adapt what i eat to Lulu's dietary restrictions. Today, I tested a fusion pot pie based on the sauce from my Ma-Po tofu recipe and a curry sauce. I added fried tofu for the protein, and included shitake mushrooms with the vegetables that traditionally go into this English dish. 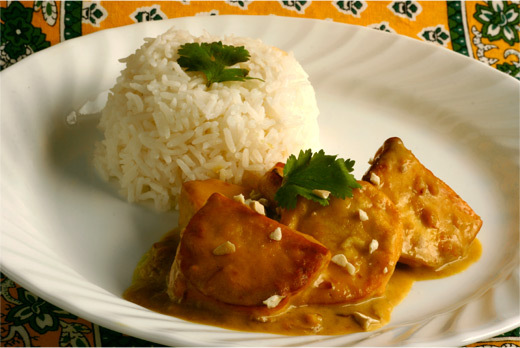 Of course, if you love meat like me, you could substitute cooked chicken for the tofu. In a skillet, heat about 1 tablespoon of oil on high heat. Add the serrano chili pepper and infuse the oil. Remove and discard the chiles. Add the minced garlic until it's slightly golden, then add the onion and cook until they are transculent. Add the sliced carrots and pour about 1/2 cup of vegetable broth. Lower the heat to a medium low and cook for about 8 minutes. Add the celery and stir frequently for about 2 minutes. Add the shitake mushrooms and the red bell peppers. Finish with the chili garlic sauce. Mix well. Extend the cooking to another minute. Season with salt and pepper. Remove from the heat. In a bowl, dissolve the tapioca strach into about 1/2 cup of vegetable broth. In a saucepan, melt the ghee over medium heat. Add the tumeric powder, coriander powder and ginger-garlic paste. Cook for a minute until the ginger and garlic are slightly golden. Add the rest of the vegetable broth. Bring the broth to a boil, then pour in the tapioca starch liquid. Stir constantly until the liquid thickens. Add the sugar, coconut powder, coconut milk and turmeric paste. Decrease the heat to low. Stir frequently to prevent the sauce from sticking to the bottom of the pan. Season with salt and pepper if necessary. Drizzle a little sesame oil. Set aside. Cut the piece of tofu into 1-inch even cubes. Pour the rest of the canola oil in a small pan. You should be able to get about a 1 inch deep layer of oil. Heat the oil for about 2 minutes. The key to a good fried tofu is to get little bubbles when the tofu is in contact with the oil. Don't overheat the oil otherwise the tofu will get too golden and chewy. Just stick to the slighlty jumping bubbles. Place the tofu one piece at a time and don't overcrowd the pan, make sure the tofu pieces don't touch each other. Lower the heat to a medium heat. Cook for 2 minutes, the tofu will start to pop and increase in volume. Flip each piece and cook about a minute longer. Pick each tofu piece with wooden chopsticks with as little oil as possible and immediately dip the tofu into the curry sauce. The tofu will deflate instantaneously. Pick up the curry-sauce-sunken tofu with another pair of clean wooden chopsticks. Repeat until all the tofu pieces are ready. Lightly spray some oil on 6 disposable pot pie pans. Remove the excess oil. Roll out the pie crusts on a very lightly flour surface. Cut into 6 disks slightly bigger than the circumference of the pot pie tins. Lay a dough round on each pot pie pan. Dock the pie crust with a fork. Brush some egg whites inside each pot pie tins lined with pie crust dough and place the pot pie tin into the refrigerator until all the rest of the preparation is ready. Add 1 1/2 tablespoons of cilantro to the curry sauce. 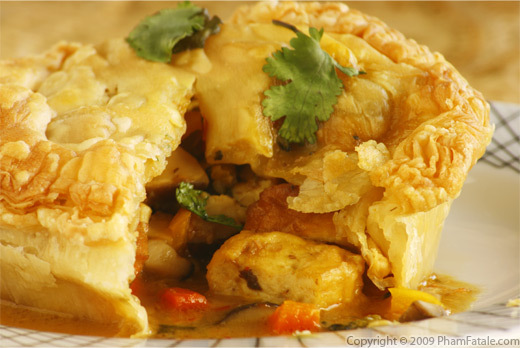 Divide the vegetables and fried tofu with warm curry sauce filling equally among the 6 pot pie tins. Don't overfill the tins with too much curry sauce. Roll the remaining 6 pieces of pie crust into 6 disks. The disks should be about 1/2 inch larger than the top of the tins. Brush the outside edges of each bowl with the egg white (the egg white will act as a glue and bond the dough together), then place the disks on top of each pot pie. Fold the excess dough under itself. Seal and crimp the dough to fold over the side with your fingers. Press the edges of the pot pie using a fork. Brush the dough with a little melted ghee using a silicone brush. Make 3 slits on the top of each pot pies using a pairing knife. 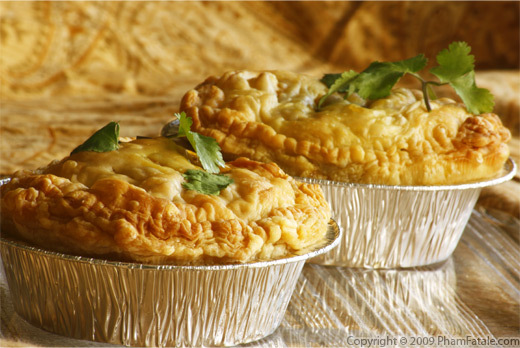 Decorate each pot pie with 3 leaves of coriander. Place the 6 pot pies on a baking sheet and place in the oven. Bake for 10 minutes at 425°F, then lower the heat to 400°F for another 20-25 minutes, until the pie crust is golden. Decorate the pot pies with more cilantro leaves on top. If you buy the pie crusts. Make sure to check the ingredients and that it does not contain any lard if you're serving this meal for vegetarians. The egg white is the secret to a non-soggy crust. It acts like a sealant to the pie when the filling is added. You also need a very cold pie dough to guarantee a flaky crust. It is important to slit a few vents into the dough on top of the pot pie to prevent the filling from oozing out during baking. I use the AROY-D coconut milk brand. It has no preservatives and it is very convenient, they sell it in little package. You can use store-bought chili garlic sauce like the one from Lee Kum Kee. It's just that my husband grew so many habanero and Thai chiles last summer. We got a whole box full. So I decided to make batches of chili garlic sauce. You can check out the recipe of the tướng ớt, literally spicy dipping sauce in Vietnamese, it's ultra easy. Indian cuisine always call for ginger garlic paste. It tastes great and is very healthy for you as well. Just clean the ginger and remove any dirt. Peel the ginger root with a paring knife, then finely chop the root. Place the chopped ginger and 5 cloves of garlic in a blender, add about 2 tablespoons (or more) of water for a smooth flow. Transfer to a jar and store in the refrigerator. You can keep this paste for at least a week in the refrigerator. I absolutely love the Thanh Son tofu brand. If you live in the Bay Area, you have to try it. They sell in almost all the Asian markets in downtown San Jose and their main shop is on 2857 Senter Road, San Jose. It's a very little shop but everything is very good. Their factory makes the best tofu texture. They make fresh tofu daily. This is the perfect place for vegetarians. I always get 2 to 3 pieces of fresh tofu every week. I also recommend to try their fried mushroom tofu cubes as well. They also serve other foods, it's very authentic. 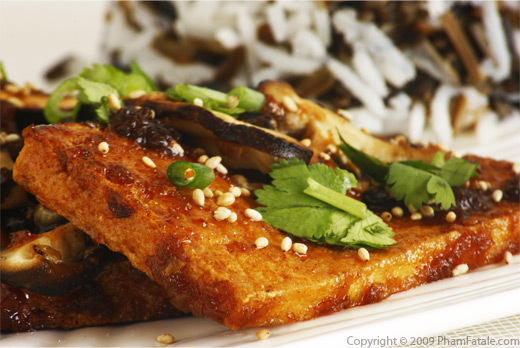 The preparation of the sunken fried tofu seems pretty simple to execute. You just need to be very careful on the temperature of the canola oil when you fry the tofu so that it really triples in volume and deflates when it is dipped in the curry sauce mixture and absorbs all its flavor. 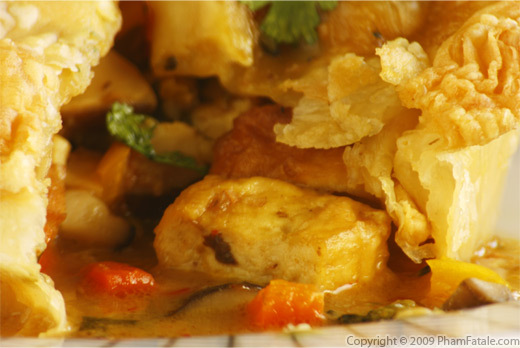 To guarantee a good absorption of the curry sauce by the fried tofu, make sure you don't add too much oil to the mixture. One tip to get a perfect thick sauce is to "over" thicken the broth prior to adding the vegetables. When you add the vegetables, the veggies will release their own liquid and will balance the texture of the sauce, especially after it's baked in the oven. 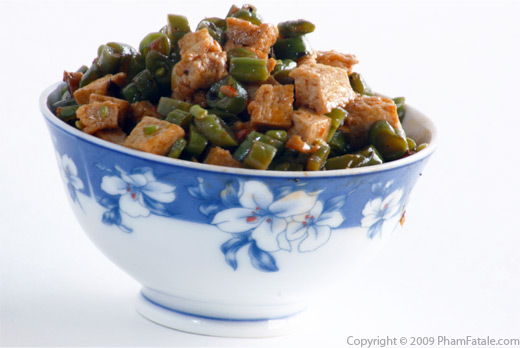 The oil used for frying the tofu is reusable. Just filter it in a cheesecloth and place in an oil can for your next use. Published By: Jacqueline Pham on April 15, 2009. Mapo tofu is one of my favorites and turning it into a pot pie is a great idea!! I really like your recipe and your step by step instructions. I will try this as well. 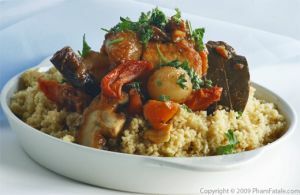 Please take a look at www.givemesomespice.com as I have loads of vegetarian recipes. 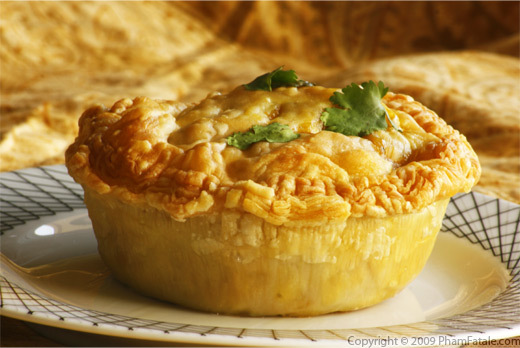 I had been looking for a good curried vegetable pot pie recipe and this is it! I had been trying to recreate one that I always order at my favorite pie shop but never could until now. I think the key is the curry sauce with the tapioca starch. Thank you so much for this wonderful recipe!!! I've made this a couple of times and shared it with my friends. They all love it too!